24 audiences attended the seminar including ERATO Momose Pj members. 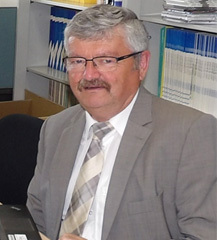 Dr. Jürgen Mohr is a Leader of Grating Development Sub-group of ERATO Momose PJ. He manages the state of the art technology, LIGA(Lithographie-Galvanoformung-Abformung) for grating fabrication. This was the chance for ERATO Project members to know the details of the fabrication process. The LIGA process combines X-ray lithography and electroforming to fabricate high aspect ratio microstructures with heights of several 100 micro meter. Due to the freedom in the cross-sectional shape the process is well suited to fabricate X-ray optical components like x-ray lenses, X-ray gratings or apertures for X-rays. In the presentation the current status of the fabrication process will be described. The performance of various lens types like objective lenses, condenser lenses and beam shaping optics will be presented. In view of grating fabrication, it will be shown how the four main challenges: realizing larger area gratings, higher grating structures, better quality and last but not least, smaller periods to achieve higher resolution will be tackled.